..tho, I have to admit, Sightline has come up with a pretty damning metaphor: They’ve got a nifty illustration of how Seattle’s zoning code, which sets aside a stunning 65 percent of developable land for single-family homes, is preventing and eviscerating equity in our city. Crunching the data on where Seattle’s best performing elementary schools are located, they show how Seattle’s exclusive zoning is hurting the city’s kids. Please read Sightline Senior Research Associate Margaret Morales’ report in full, but per usual with these excellent, in-depth Sightline policy papers, I’m going to provide my own CliffsNotes headlines and then quote the post at length. I. Seattle’s best schools are disproportionately located in Seattle’s single-family zones. By legalizing a broader spectrum of housing options in single-family zones, and therefore a range of price points, more students with diverse economic backgrounds could attend Seattle’s top public schools. Though the district as a whole boasts many strong schools, most of them sit in an east-west strip north of downtown and south of 85th Street, as shown in the map below. Another small cluster is in the northern half of West Seattle. Both of these areas are also sites of much of the city’s most expensive residential real estate, restricted by single-family zoning. II. 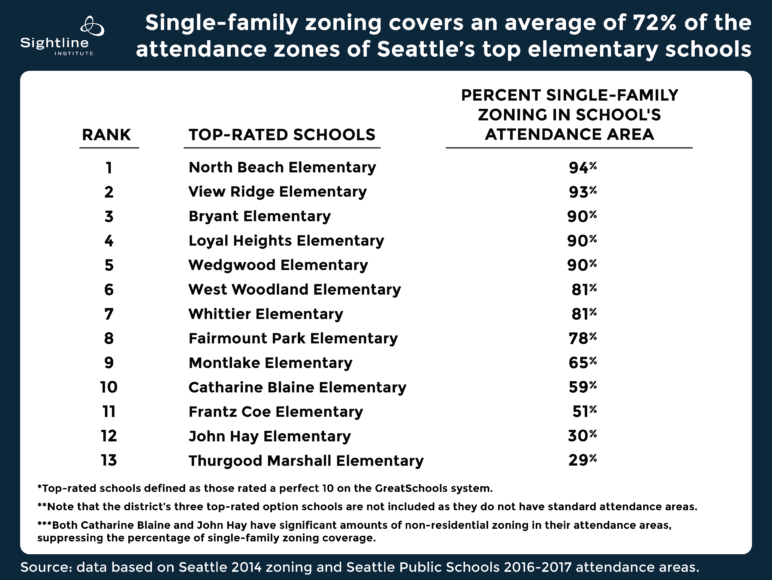 Single family zones bar low-income families and kids of color from having access to Seattle’s top performing schools. Zoning decisions shape more than building types; they decide who lives where. Restrictive zoning results in less diversity in the housing stock near these schools: more than two-thirds of the dwellings in census tracts surrounding the city’s 16 10-rated schools are single-family homes. In comparison, about half of the city’s overall housing stock is single-family homes. And home values in these schools’ neighborhoods reflect this crunch, averaging 20 percent more than the estimated value of the typical Seattle home. For example, the figure below shows that the average home price in the neighborhood surrounding Montlake Elementary surpasses $1 million. For families that can’t afford to buy a home, it’s also particularly difficult to find and afford a rental near the city’s top schools. On average, census tracts surrounding 10-rated schools have 11 percentage points fewer renter-occupied units than average in the city, and rent is $334 more per month near those schools. The city’s choices about zoning…is one factor that yields a school district that is increasingly segregated by income and race. In Seattle, the benefits of a top-notch elementary education are disproportionately available to children from white, English-speaking families with high incomes. For decades, most public policy efforts to redress this inequity have focused on transporting some children daily to integrate schools, and such approaches may deserve fresh attention in Seattle. III. Adding more affordable multi-family housing near the city’s best schools could help desegregate Seattle’s schools both racially and economically. Zoning is just one piece of a complex puzzle, but a modest additional contribution to school desegregation by race and class could come from allowing more duplexes, cottages, and other housing choices in the single-family zones that surround many top schools. Each of these multi-family units in single-family zones surrounding the Emerald City’s top public elementary schools represents much-needed diversity in the housing stock. Accessory dwelling units and many of the ‘plexes are rental options in rent-parched neighborhoods. They create housing options for families not able to purchase a home at the city’s high asking prices. The townhouses and rowhouses may be owner-occupied and often come with a lower price tag than a typical detached single-family home. Allowing more of these kinds of homes in single-family zones could create a greater range of housing prices, potentially welcoming more families to rent or own homes near top-notch schools. Increasing the diversity of housing options in the vicinity of high-performing schools and therefore boosting the number of kids who live in these schools’ attendance zones might seem like a recipe for crowding the schools. 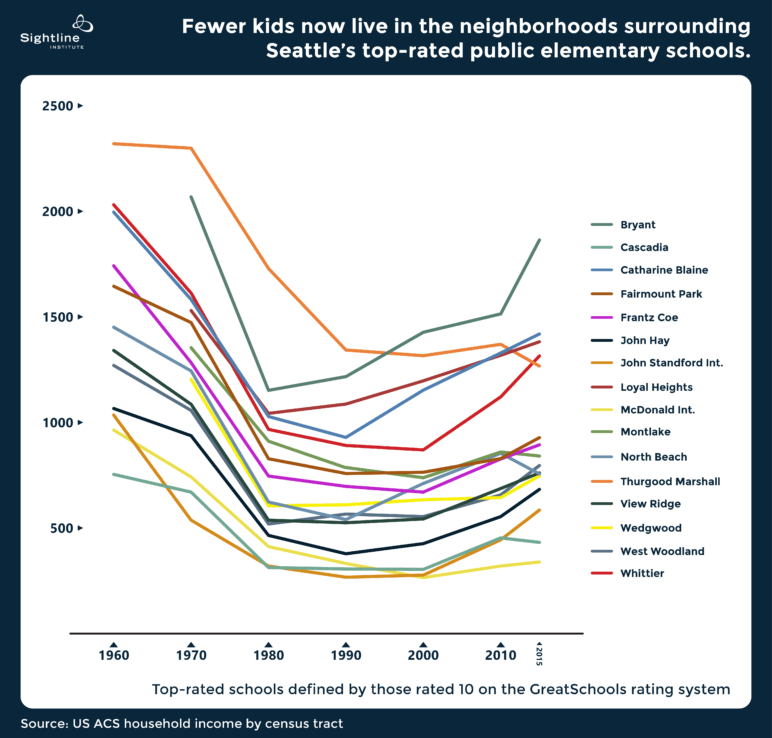 While this analysis does not include an assessment of space for additional students in each building, nor options for expanding that space through things such as the portable classrooms that Seattle used extensively during the baby boom, it’s relevant to examine the number of children in the neighborhoods in question. This figure below shows the population over time of children under the age of 18 living in the census tracts that hold today’s highest-rated Seattle elementary schools. Though the overall populations of children in most top schools’ neighborhoods have bounced back from their lows in the 1990s, they remain far below their levels in the baby boom years of the 1960s. Opening up more housing options in these neighborhoods could provide an opportunity for a more diverse group of children to gain access to these top educational opportunities—without adding more children than these neighborhoods have accommodated comfortably in past decades. Currently housing diversity found on most land surrounding the top schools is either a fluke of zoning codes past or a result of ADUs that were built by owners willing and able to surmount steep regulatory barriers. Different choices—and attitudes—about zoning are one key for the city to open up its best schools to more children. Current regulations excessively limit and slow ADU construction. Removing these policy barriers could provide more housing options in more neighborhoods. In addition, the proposal in the city’s Housing Affordability and Livability Agenda to permit a greater range of housing options in single-family zones, including small ‘plexes and townhomes, could create housing that fits a range of family sizes, styles, and needs. Seattle has the opportunity to foster more welcoming neighborhoods and in doing so help dismantle a structural factor in the resegregation of its schools. Diversifying housing options in single-family zones near public elementary schools across Seattle would make a difference for one of the city’s most vulnerable, and precious, populations: its kids.